In response to communication from CAMERA’s Israel office, the Agence France Presse (AFP) last week corrected an article which claimed that “[s]ome 17 journalists were killed covering the July-August Gaza war” (“Israel ministry video lashes out at foreign journalists“). As noted by CAMERA, AFP failed to cite a source, yet stated the 17 figure as a fact. The number is in fact a Hamas claim, disputed by the Israeli Meir Amit Intelligence and Terrorism Information Center, which documented that eight of the 17 were Hamas or Palestinian Islamic Jihad terrorists or worked for Hamas or Islamic Jihad media outlets. AFP amended the article, and correctly attributed the figure of 17 journalists killed to Hamas, as opposed to just reporting it as fact, and noted that the Meir Amit center disputes Hamas’ figure. Shortly after the CAMERA prompted correction, UK Media Watch contacted editors at the Daily Mail, which had published the AFP report, asking that they follow suit and replace the original article with the corrected version. Today, editors responded to our complaint, and informed us that they agreed to our request. We’ve highlighted the added text in the relevant passage. We commend Daily Mail editors for the positive response to our complaint. I always feel that corrections fall short. 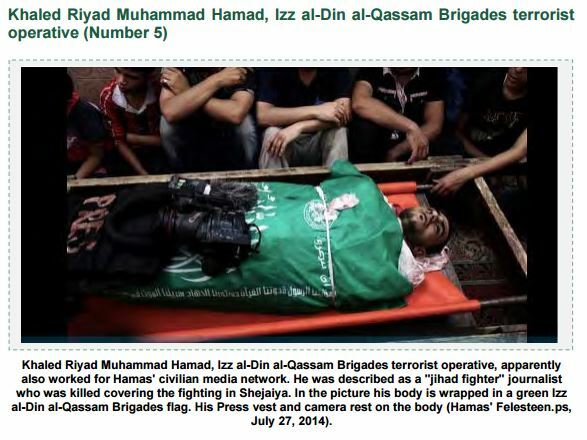 I know it is nice to get a correction at all, but it should have said that the original report came from Hamas. Even mentioning “Palestinian sources” falls short of saying Hamas.